Hello.. 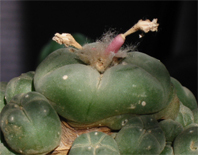 I was wondering if you know anything about cloning lophophora or other cacti? I have seen some german web pages and it seems that they cut the cactus into very small pieces in a sterile environment, the pieces of flesh are put onto some kind of agar gel, then after a while the flesh begins growing babies like crazy.. I would like to try this but I need more sources for info. I'm also fascinated by the subject, and have subscribed to the Home Plant Tissue Culture Yahoo group for a while - but never got around to do any experiments. Below I've listed a handful of articles that might interest you. If you try tissue culture propagation of cacti I would be glad to learn about your results. Mauseth, J. D. 1977. Cactus tissue culture: a potential method of propagation. Cactus and Succulent Journal (USA) 49: 80-81. Mauseth, J. D. 1979. 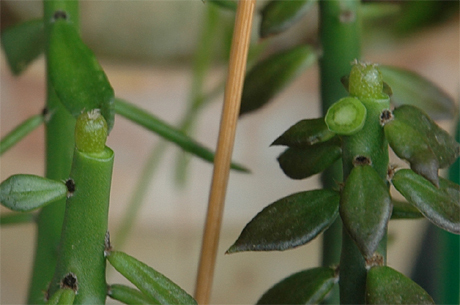 A new method for the propagation of cacti: sterile culture of axillary buds. Cactus and Succulent Journal (USA) 51: 186-187. I have an emergency.. I have a caespitosa which now has four offsets grafted onto a pereskiopsis. The scion is about an inch in diameter. The problem is that the pereskiopsis has begun to shrivle and loose the green color.. Is it dying? It’s hard to say what’s happening to your Pereskiopsis. It might be shriveling due to lack of water or it might be dying. This winter the Pereskiopsis stock for one of the Lophophora diffusa (RS 1193; Peña Miller, Queretaro) scions mentioned above suddenly withered and died. This happened for no apparent reason and the rest of the plants, growing in the same pot, are unaffected. If your stock plant is dying it’s no disaster - you can either re-graft the scion on a more sturdy stock, e.g. Trichocereus, or cut out all of the dead plant material (using a sterilized knife) and leave the scion to callus; after a while it will form new roots.